Jet Age missions' Runway Lighting standard ? How detailed ? Topic: Jet Age missions' Runway Lighting standard ? How detailed ? I'm myself trying to make a small single mission (or quick mission) for Jet Age (especially B.A.T. - JTW). I want to install modern colored Runway Lights and Taxiway Lights. 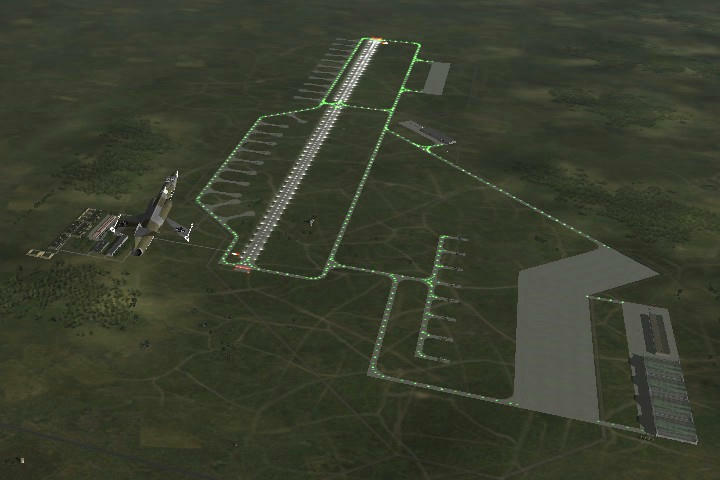 How detailed Runway Lights / Taxiway Lights are needed for IL-2 1946 Jet Age missions ? Full Historical install is impossible because of IL-2 1946's light objects are Non-Directional. 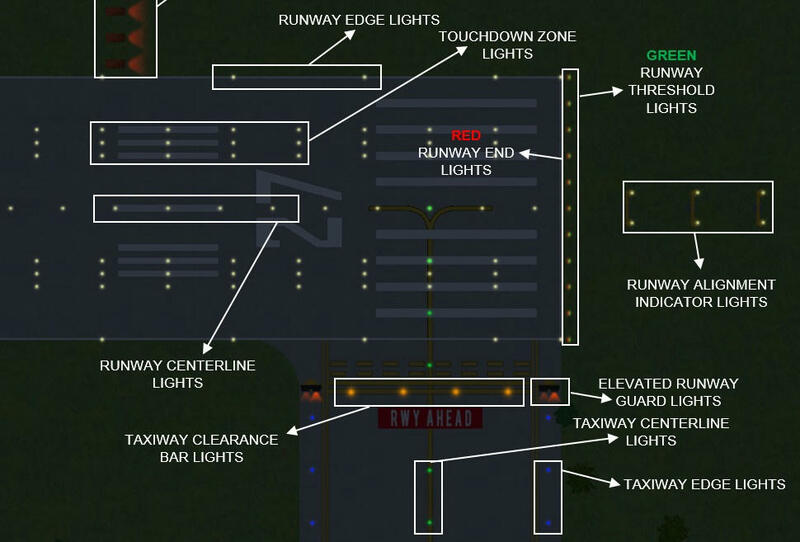 Many of historical Runway Lights need Directional coloring like (Approach side - Green; End side - Red); (Approach side - White; End side - Red); etc. And Too many Light objects will make the mission heavier. Taxing or Running on heavy lighted ways will give fps dropping. My current thought of order. Runway's left side and right side by White. No difficulty, a bit giving-up historical. Runway's start threshold and end threshold. Historical --- See from Approaching side = Green, See from runway inside = Red ..... Impossible in IL-2 1946. Only all white is possible in IL-2 1946, in omitting runway end White+Red mixed part and Red seen from take-off part. Taxiway's center-line by Green (omitting lead-off / lead-on function directional with Yellow). I want to install it with enough spare time. Taxiway and apron's edge by Blue. Technical difficulty is none, but work load is high. Technical difficulty is none, but work load is high; necessity is low. Work load is higher; necessity is lower. Re: Jet Age missions' Runway Lighting standard ? How detailed ? 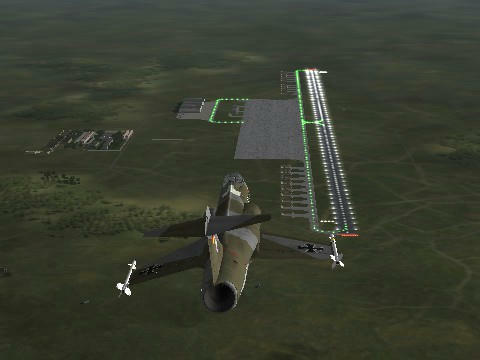 WIP screenshots those 3 lights are installed on a runway. Spans between each lights are wider to decrease light effect numbers. Directional Yellow changes near end only seen from inside is not made. Runway End lights by Red is historical. Runway Threshold lights is unhistorical, that's to be seen Green from outside. Directional Red mixes and changes near end only seen from inside is not made. Umm ..... feeling a bit local only with those 3 groups ? To make lively as modern big Airbase --- Taxiway centerline lights / Taxiway edge lights are better to be installed ? In my opinion quite an interesting topic. There are many variations of the approach lights system. Depending on the choice of approaching lights, you can choose one or the other. To the edge of the runway is necessary to choose a bright white. plain white - for the centerline RWY. If you choose additional modes, such as "realistic lights" - the center line lights will flash. I believe that for greater realism, it is necessary to add, albeit a short, line of approach lights. I set my superior level lowest about Approach lights. When I'll try it, making new 3d objects instead of arranging stock light objects. Light objects function is not enough for ALS realism. The airbases look enough crowded from far, no more needed Taxiway edge lights by Blue. ALS 3d models will be future tasks ! My 1st lighting mission pack is published as B.A.T. - JTW - QMB. Thanks your advises and interests.